In this article, you will know about three easy, useful and absolutely FREE Android applications that facilitate serial communication between Arduino and Android via Bluetooth medium. Before moving on to applications, you can check this article to know about the fundamentals of Android-Arduino communication using Bluetooth. Now, let’s start with the applications first, then we can move on to some simple experiments. SENA BTerm is a VT-100 Terminal Emulator for Bluetooth communication. It enables the Android devices to connect to any remote Bluetooth devices supporting Serial Port Profile(SPP) and to exchange data with them. You will need a Bluetooth adapter for communication between Android and Arduino. Go to this link for more information. It provides easy ways to manage the Bluetooth adapter of the local device and to send control keys , alternate keys, function keys and other special keys. * It is a VT-100/ANSI Terminal Emulator. * It supports Serial Port Profile(SPP). * It can play a role in Bluetooth master and slave. * It can configure SENA Bluetooth serial devices through Bluetooth connection. * It provides easy and various ways to manage Bluetooth adapter of the local machine. * It provides easy ways to send special keys. * It displays sent and received data in terminal pane. * It displays log data in HEX mode. VT-100 terminal emulator for communicating with any serial device using a Bluetooth serial adapter, for example a General Bluetooth Adapter. The RFCOMM/SPP protocol emulates serial communications over Bluetooth. You need a Bluetooth Serial adapter. A general Bluetooth adapter should work perfectly well. This is an open source application and you can download it from android market. It is a low cost and excellent adapter. 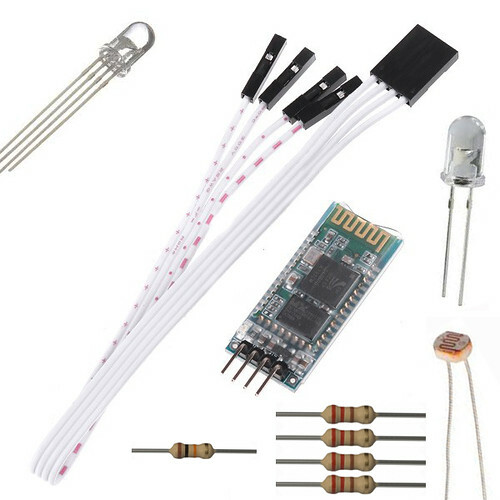 You can buy the following Bluetooth Experiment Pack from buildcircuit.net. Experiment links can be found on the web store.